(Nanowerk News) According to researchers at Aalto University, by using suitable systems, more than 80% of heating energy for Finnish households could be produced using solar energy (Renewable Energy, "A long-term performance analysis of three different configurations for community-sized solar heating systems in high latitudes"). 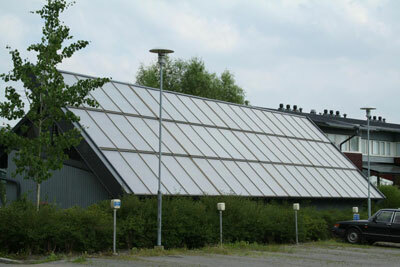 As the price of heating energy obtained from solar heating systems needed to be competitive with the currently used heating alternatives, calculations made by researchers showed that renewable energy could be used to cover 53-81% of annual domestic heating energy consumption depending on the technical implementation method. The researchers calculated the amount of solar heat obtained for heating the households when excess energy was stored for use during cold periods. The researchers calculated the amount of heat obtained for practical use when energy for heating households was accumulated using solar heating and the accumulated heat was stored for use during cold periods. In their calculations, the researchers studied the use of both above-ground water storage tanks for short-term heat storage and a borehole storage suited for seasonal storage. The results depended on the method of how the heat pumps and the water storage tanks and the borehole storage for storing heat were used together.